If you’ve recently had popular plantation shutters installed in your home, we bet you’re over the moon with their functional practicality and sleek design. We know you’ll also want to keep them looking as good as the day they were installed! Just like any other window covering, plantation shutters need to be cleaned regularly to ensure that they stay looking good and in proper working order. Making sure you’re using the best cleaning method will keep your plantation shutters in tip-top condition for many years to come. Let’s take a look at the best way to clean your plantation shutters, for all materials and finishes – timber, polywood or external aluminium. If your plantation shutters are the very popular Basswood timber type, it’s best to keep things simple. You’ll want to clean them without using a lot of water or any harsh cleaning materials. We recommend using a dusting cloth or brush, a vacuum, and a small brush that you can wet. First, run the vacuum with the brush attachment over the shutters to remove as much dust and debris as possible. Use the soft dusting cloth to get in between each shutter, picking up any remaining dirt or dust. After you’ve done that, wet the soft cloth slightly with water or another gentle cleaning material and (gently!) scrub any particularly stubborn areas or stains on the timber. With another DRY cloth, dry off any areas you’ve wet to avoid any warping or damage to the surface of the shutters. Your plantation shutters may be made of a different material to timber – they may be polywood. This is a synthetic material that can be cleaned using harsher cleaning materials if needed. Start with the same dry methods as used for timber shutters (above). Vacuum to remove dust and debris, then use your soft cloth with either a small amount of water or cleaning solution, as needed. Pay particular attention to the spaces where the frame and the shutters meet and the sides of the shutters – any small spaces where dust can build up. Plantation shutters are often used on the exterior of houses, as a popular window covering that allows privacy and light control. Exterior shutters will probably need a bit more thorough cleaning than internal shutters, with a soapy cleaning product. You can start by using a hose or pressure washer to get all the loose dirt and material off the shutters. Dish soap and water can work well for cleaning, but some bleach could help remove stubborn mould or stains. You can always patch test on an easily hidden area first to make sure you won’t discolour the shutter. One last thing to consider: some of your plantation shutters are more likely to require more detailed cleaning, more often. Shutters that are located in your bathroom, kitchen, dining areas, and children’s rooms can easily accumulate grease, airborne food particles, accidental food splatters, hairspray, dirt, and other forms of dirt and debris. For these locations, make sure you clean your plantation shutters weekly, to keep them looking as good as new. 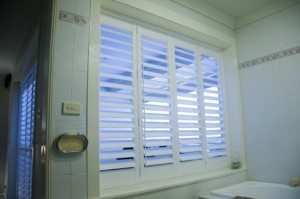 For more advice on cleaning plantation shutters, or to take a look at their various designs and styles, why not visit the blind and shutter experts at Modern Blinds. You can stop in to their Southport showroom to see their huge range of quality window furnishing products, including the ever-popular plantation shutters.